Do you guys ever plan outfits? This might sound crazy but I bought this dress from Primark way back at the end of spring (May maybe) with the single vision of wearing it with this jumper this autumn. I'm sure some of you are thinking I'm mad, and I promise I have worn this dress quite a few times over summer, but I desperately wanted more things that would go with this jumper (a hand me down from an old flatmate). Luckily it worked as well as I thought it would. The colours are perfect for this time of year, and the little daisies on the dress are adorable. I think this outfit kind of incorporates everything I love about style into one ball. 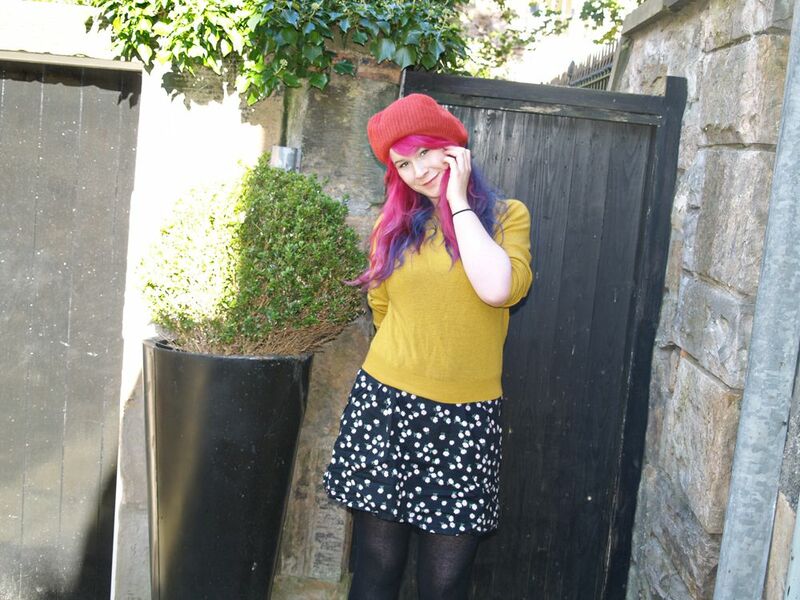 A cheap Primark dress, a second hand jumper, my mum's shoes (again) and a hat that used to belong to my gran. If only I had a charity shop find in there too. I love rescuing clothes, even more than I love a good bargain. Anyway, TGIF guys, are you looking forward to the weekend as much as I am? I plan outfits alllll the time! It makes it easier to get dressed in the morning! 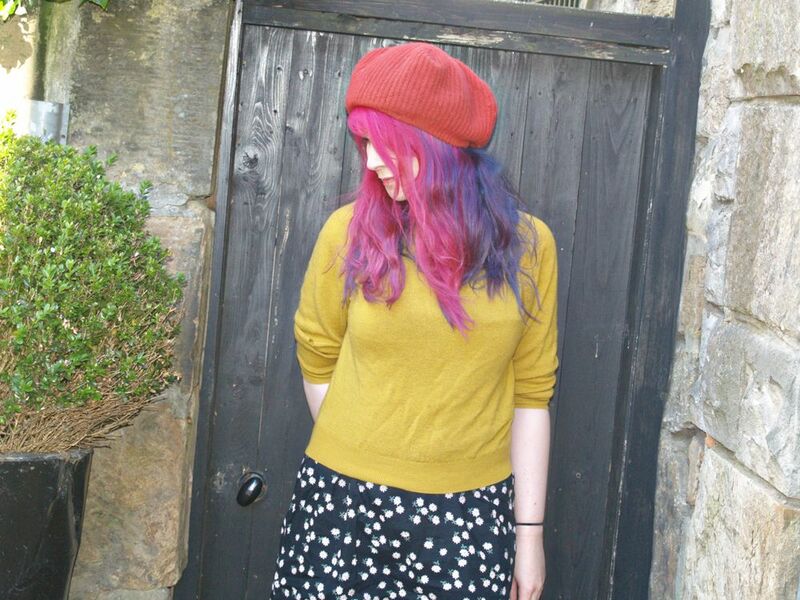 I love this jumper it's such a gorgeous colour and looks amazing with that skirt! Yep, I plan outfits, too. I keep picking out things with horses on and going, "I could wear that to the Kelso ride outs next July..."
What a great little outfit! I love all the colors. And I am absolutely head over heels in love with your hair, those colors are just so wonderfully fantastic! I love autumnising dresses! Actually, I kind of do that in the summer anyway, I get cold quite easily. I love your hair with the hat! This outfit is so cute, and it's made special because of all the personal touches, you know? Your hair continues to stun me, it's beautiful! 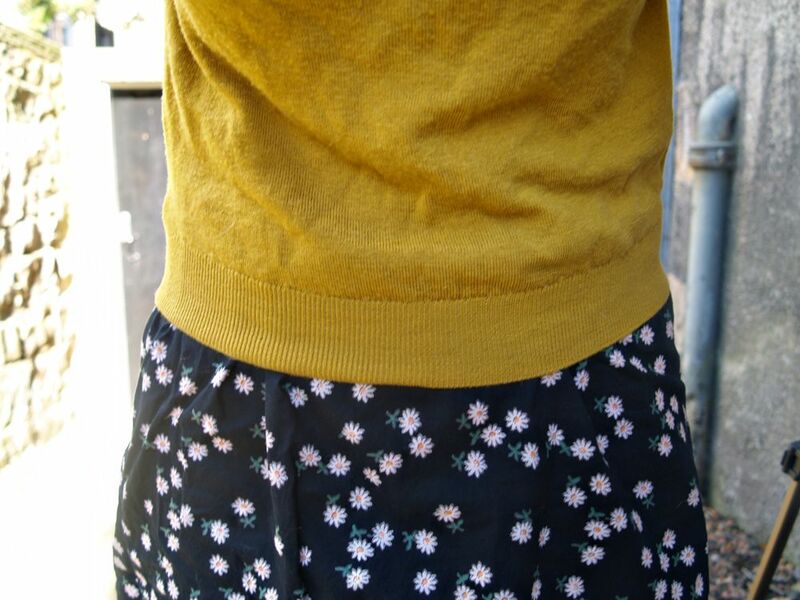 Love the combination of the mustard and floral print. I do that all the time actually. I'm glad that this worked out for you--it looks great! I love your hat and, of course, your hair! 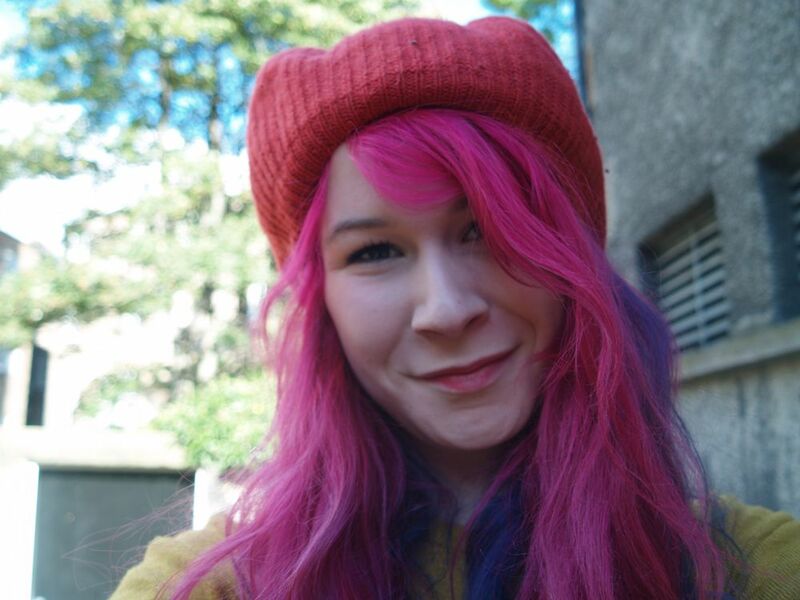 Your blog is so very pretty and I love your hair. There's nothing more fun that wearing thrifted clothes. Your outfit it lovely, I really love the daisy print on the dress (daisies are my fave flower). I wish I had Primark where I live, people always seem to have so many cool Primark finds.